Luca Cambiaso's father was a painter, and he received his first training from him, but the son far surpassed his father in terms both of his commissions and his art. He was the leading painter in Genoa for the second half of the 16th century and introduced Mannerism to Genoa. He also attracted international patrons and died in Madrid while working on a series of large paintings for Philip II's Escorial palace / retreat / monastery. The arrival in 1528 of Perino del Vaga, Raphael's pupil and an important member of his workshop, fleeing from the Sack of Rome, transformed the sleepy Genoese art scene. Andrea Doria, the ruler of Genoa, immediately hired Perino as de facto artistic director, much as the Gonzagas in Mantua had hired Giulio Romano in similar circumstances. Perino's decorative scheme became for the next generation of Genoese artists what Raphael's logge had become in Rome: a school for artists. It remained, however, for Luca Cambiaso to define in fullness the style that would dominate in Genoa for a considerable time to come. Combining his knowledge of works by Perino, Beccafumi, Pordenone, Giulio Romano, Michelangelo, Correggio, Titian, and Veronese, he defined the high style of art in Genoa for the immediate future. As Bettina Suida Maning put it, "Numerous frescos, thousands of drawings, revealing a wealth of imagination which seems to go beyond the capacity of a single human being, and easel paintings of great beauty and serenity are the legacy that Cambiaso bestowed upon Liguria. Within the little more than three decades of his activity in and around Genoa, Luca Cambiaso created a style so clearly defined and of such immediate appeal and deep-rooted strength that he succeeded in educating an indigenous group of artists who, borne on the powerful pinions of his genius, emerged strong enough not to be consumed by the effulgence of such overwhelming artists as Rubens and Van Dyck" (Genoese Masters: Cambiaso to Magnasco, 1550-1750, no page numbers). Luca produced many drawings (perhaps, as Jonathan Bober has suggested, because Genoa had no tradition of print making able to spread the ideas and inventions of artist, he decided to use "the systematic and extensive . . . replication of drawings" as a substitute [Luca Cambiaso 1527-1585, 84-85): "The replicas were of autonomous works and preparatory studies alike. The most faithful repeat their prototypes with such uncanny fidelity to every mark that they can be distinguished only be a slightly more uniform speed and deliberate gesture" (p. 84) and, most interestingly, Bober suggests that they also satisfied a burgeoning desire among collectors for drawings "in which a graphic personality is paramount" (85). In the 17th century, etchings done by the artists themselves would serve this need, but in Genoa, Cambiaso's solution seems to have worked. Select Bibliography: Dante Bernini, ed., Luca Cambiaso e la sua cerchia: Disegni inedit da un album Palermitano del '700 (Genova: SAGEP Editrice, 1985); Jonathan Bober, ed., Luca Cambiaso 1527-1585 (Milano: Silvana Editoriale, 2006); Piero Boccardo, Franco Boggero, Clario Di Fabio, and Lauro Magnani, eds. with Jonathan Bober, Luca Cambiaso. Un maestro del Cinquecento europeo (Milano: Silvana Editoriale, 2007); Veronique Damian, Luca Cambiaso (1527-1585): Trois Nocturnes Resdecouverts (Paris: Galerie Canesso, 2004); Lauro Magnani, Luca Cambiaso, Da Genova all' Escorial (Genova: SAGEP 1995); Lauro Magnani & Heribert Schulz, Geometrie der Figur: Luca Cambiaso und die moderne Kunst (Museums-U. Kunstverein Osnabrück, 2007); Lauro Magnani & Giorgio Rossini, La "maniera" di Luca Cambiaso. Confronti, spazio decorativo, tecniche (Genova: San Giorgio Editrice, 2008); Bettina Suida Manning & Robert L. Manning, Genoese Masters: Cambiaso to Magnasco, 1550-1750 (Dayton: Dayton Art Institute, 1962); Bettina Suida Manning & William Suida, Luca Cambiaso, La Vita e Le Opere (Milan: Casa Editrice Ceschina, 1958). Luca Cambiaso, attributed to, Judith beheading Holofernes. Pen and brown ink and wash and pencil. A quick sketch of a woman holding a sword in her right hand while a servant waits behind her as they approach a man sprawled on a bed. Cream laid paper mounted on laid paper. 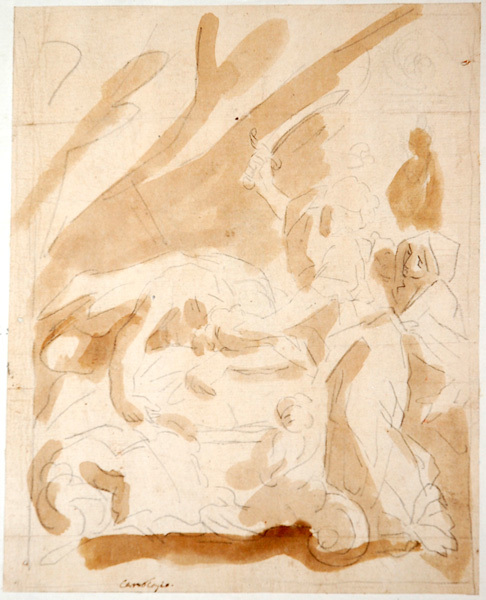 Attributed to Cambiaso in brown ink left-center at the bottom of the sheet. A master of a quick spontaneous drawing style, Cambiaso produced many "ebullient and energetic drawings." This one seems to date from the earlier part of his career. Image size: 225x180mm. Price: $9500.